You can use Google as your online currency converter or to find the current currency conversion rates which are updated in realtime. The source for currency conversion rates on Google is Citibank N.A. The best thing about using Google as your currency converter is that it detects your home country automatically and you need not select your home currency which is useful in many cases when we want to find the conversion rate of USD $ with respect to home country currency. Although, the rates are current, yet Google provides a little disclaimer notes notifying that the rates and the conversion displayed is for information purpose only and can not be attributed as basis for your transaction. 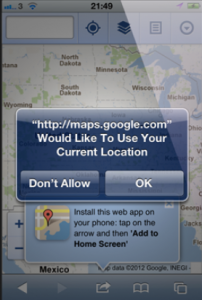 Further neither Google nor Citibank is liable for any differences in the rates. This disclaimer note is necessary as you know how susceptible currency conversion rates are. Type directly your currency conversion query into the following format : 10000$ to inr, 100 $ to rs, convert 25 dollars to pounds or simply enter number currency1 currency without using any verb as 3000 $ rs or 3000 $ pound . On the search results page, Google will display the result alongwith a visual currency converter with base currency selected. Just enter your values in the respective currency boxes and it will convert it in other currency in realtime. To change the currency type, just click on view more conversions link located below the currency field boxes and then you can select from a list of currencies of all countries. You can also bring up the visual Google currency converter by just searching for any of these terms – currency converter, currency conversion, currency, currency trading or currency exchange on Google. You can use Google as currency converter for Mobile phone as well in the same way as you do on your computer. Beside displaying conversion rates, it also displays currency chart/graph of 5 years. 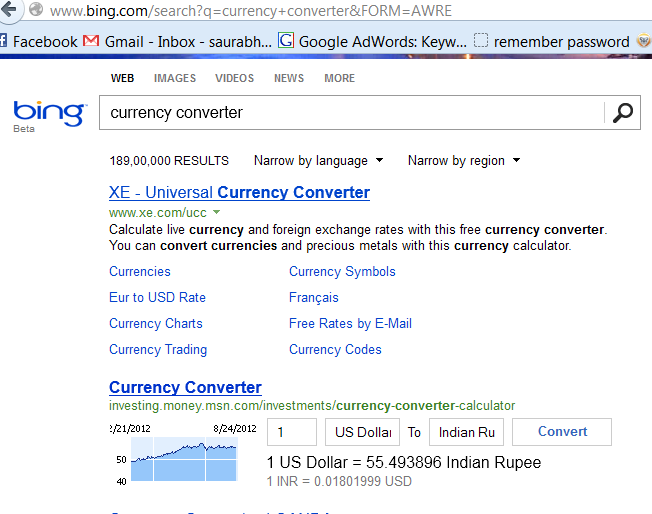 In Bing search engine (bing.com), for currency conversion, you need to enter 1 $ to inr or 1 $ to pound. If you enter 1 $ pound without using preposition(to), it won’t do conversion. Bing utilizes msn.com for its currency conversion job. 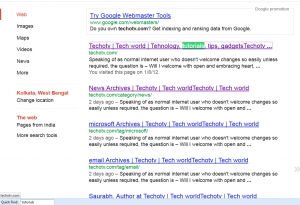 You can search for currency converter on bing.com to bring up converter in search results page but the application might not be ranking on its 1st position, Hence Bing is actually doing its currency conversion task in interactive rich snippet utility of its msn.com website. Hence we like the Google Currency converter more and prefer it to Bing. Pingback: Free Online Converter | Units Converter | Convert Temperature, Mass..